Boxing is an excellent weight-loss exercise. How many calories you burn when punching a punching bag depends on how many pounds you weigh, how long you exercise and the intensity of your routine. Learning boxing by punching a punching bag also gives you the opportunity to participate in other boxing exercises. 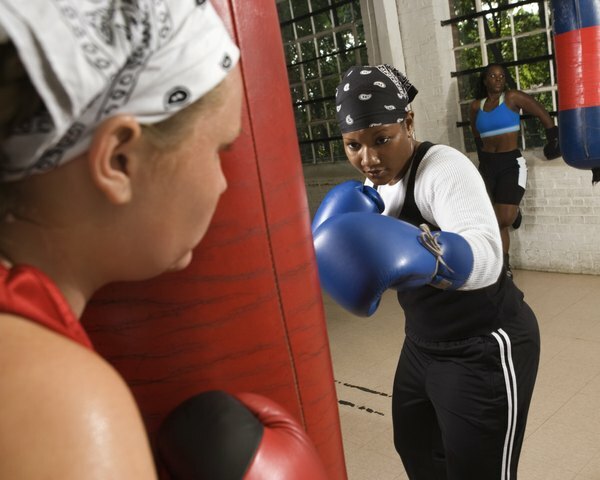 The cardiovascular effects of boxing in the ring make it an effective calorie-burning exercise. The average 130-pound person burns 354 calories per hour punching a punching bag, while the average 155-pound person burns 422 calories per hour and the average 190-pound person burns 518 calories per hour, according to the Wisconsin Department of Health and Family Services. You lose 1 pound when you burn 3,500 calories, so the average 130-pound person punching a bag one hour daily every three days can lose 1 pound per month, or 12 pounds per year. The average 155-pound person punching a punching bag 10 times per month will lose about 14.5 pounds per year, while the average 190-pound person will lose about 18 pounds per year. 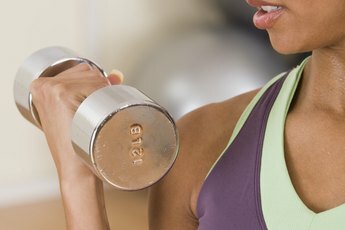 You will burn more calories if you increase the intensity of your exercise. The American College of Sports Medicine reports that you’re exercising vigorously if your heart rate is 70 to 89 percent of your maximum heart rate, which is 220 heartbeats per minute minus your age. A moderate level of exercise is achieved when your heart rate is 55 to 69 percent of your maximum heart rate. 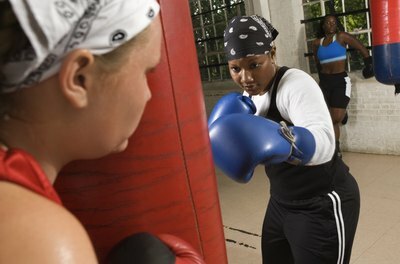 When punching a bag, box as if you’re in a ring so you will be exercising more vigorously and burning more calories. Move your legs as if you were going toward and away from an opponent. You should also move your head -- a technique called feinting -- and throw a variety of punches so you’re moving your arms more. Standing still burns fewer calories. Improving your boxing skills will allow you to box against opponents. Sparring for one hour burns 531 calories if you weigh 130 pounds, 633 calories if you’re 155 pounds and 776 calories if you’re 190 pounds, the Wisconsin Department of Health and Family Services says. Boxing in a ring for one hour burns 708 calories if you weigh 130 pounds, 844 calories if you’re 155 pounds and 1,035 calories if you’re 190 pounds. You will burn more calories than these averages if you’re more active during the bouts. If sparring with an opponent, always wear a helmet and other safety gear. Boxers should cross train by performing other types of exercises. The muscles you exercise need 48 hours to recover and are susceptible to injury if you exercise on consecutive days. 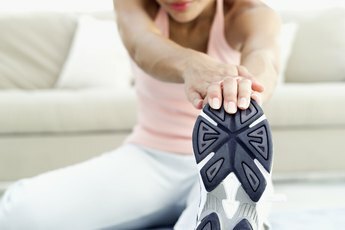 In the textbook “An Invitation to Health,” author Dianne Hales recommends cardiovascular exercises, such as jogging or swimming, three to five days per week, strengthening exercises such as situps two to three days per week, and flexibility exercises two to three days per week. This will boost your overall calorie burn.